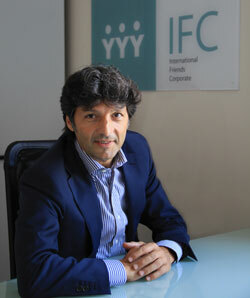 Navigate: Homage / News / Interview with Ferruccio ALESSANDRIA, President of IFC S.p.A.
Interview with Ferruccio ALESSANDRIA, President of IFC S.p.A.
Mr. Alessandria, can you tell us how the idea of creating IFC came about? IFC was born as an adventure that began with a dream; in short, it could be said that it came about to fill a void. The fundamental innovation in the IFC S.p.A. project is to offer what today is not on the market: a quality of service that meets the expectations of the most demanding clientele. This analysis, which grew out of some thirty years of experience in the field, is combined with the desire to provide a personal and innovative vision of the evolution-in-progress in the wellness universe. IFC considers the world of wellness as the sum total of all of the products and services that, according to a luxury-brand style, satisfy the client's desires, regarding décor and customisation of house and garden, with an idea of wellness, while pursuing, at the same time, the application of the concepts of design and luxury to the pool areas and the leisure zones, integrated harmoniously with the architecture of the dwelling - always with the highest levels of customisation. What objectives do you propose for the Italian market in terms of product/company? Our primary objective is the creation of a synergetic Group comprised of a series of "key" companies within the panorama of the wellness industry, through which a new market benchmark can be created, analysing and creating a line that can best unite the following elements: quality – innovation and design – service, under the banner of a code of ethics within which the concept of the business is indissolubly bound to the principles of loyalty and respect for man and nature in all of its manifestations. We are already working toward these concepts becoming reality: quality will be assured by the careful selection of products and suppliers and by rigorous materials research and development. Innovation and design are concepts that will compel the redesign of the wellness and pool merchandise lines and classic products as well, using the most quoted and qualified Made-In-Italy designers. Innovations in service foresee the creation of a network of exclusive dealers covering the Italian and European territory insuring a high and homogeneous standard of quality, starting with the custom design on up to the “turnkey” delivery. And on the international market? The company profile was born with an "international" trademark. Once our presence on the Italian market has been firmly established, we feel that our philosophy contains all of the elements for our quality to be a success on the European market. I'll illustrate the concept by repeating the guidelines that animate our identification and the composition of our product lines: enable the consumer to choose among different possible solutions, that are however, interpreted with a leitmotif identified by design – Italian, first of all – and by a common quality policy. The appropriateness of these guidelines imparted by way of our exclusive distributors and dealers, has already been recognised by top-level businesses in the foreign market. In your opinion, what are the prospects for the Italian wellness and pool market?